Youth Voice activity, led by Sound Connections, explored models of empowering youth voice within the commissioning process through student consultation and leadership opportunities. Sound Connections Programme Manager Jennifer Raven reflects on Youth Voice & Participation activity explored through Creative Schools. Read a case study of the Young Producers project delivered with ten Sarah Bonnell students. What is Youth Voice & Participation? By Youth Voice & Participation we mean listening to young people, valuing what you hear and acting upon it; empowering young people to shape, lead and produce their own activities; enabling young people to be involved at a governance level of organisations and be part of decision making. At its heart it’s about co-producing, working collaboratively, and staff and participants working side-by-side. To learn more about Youth Voice and Participation in a music and arts context, you can go to the Sound Connections Youth Voice & Participation research site www.sound-connections.org.uk/rewired. What were the Creative Schools principles of Youth Voice? These principles remain as relevant two years on. The main learning was about the challenges of embedding Youth Voice in schools, as prior to Creative Schools most of Sound Connections’ experience had been in non-school settings. Whilst Youth Voice (commonly known as Pupil or Student Voice in schools) is a recognised part of many school communities, it often takes shape through a Student Council that has limited decision-making power beyond specific projects or initiatives. 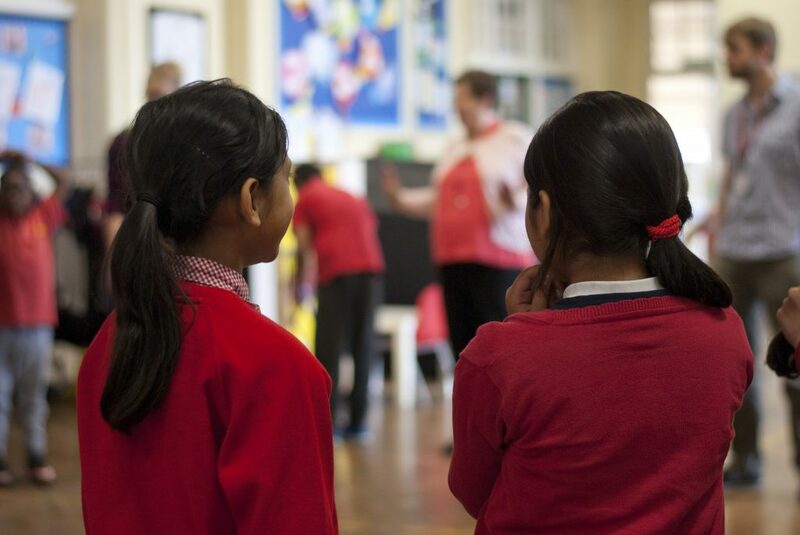 More research is needed into Youth Voice in a schools context, and there is an opportunity to gather case studies of good practice, such as Gomersal Primary School’s Arts Council. At the time of writing, the project at Sarah Bonnell is complete with planning underway at Gallions. Sound Connections works across the country raising awareness of Youth Voice & Participation and supporting organisations to embed it within practice and policy. Evidence suggests that Youth Voice is undoubtedly something arts organisations (and to some extent schools) are keen to get better at. There is also evidence that funders are more readily requesting that organisations are able to demonstrate how they have consulted with their participants, and involved them in programme design and implementation. Evaluation and feedback from Creative Schools suggests that the Youth Voice programme strand has sparked interest and learning amongst a wide range of organisations in East London – in programme feedback, empowering Youth Voice ranked as the most highly valued area of the programme for cultural organisations. We hope that these organisations can and will continue independently exploring Youth Voice practice in their work, and resources shared here will be a useful reference point. Within the partnership there are already a number of organisations working to the principles of Youth Voice, and there is certainly strength in practice being explored across a large-scale strategic partnership, where skills, experience and evidence can be shared. Overall solid foundations have been laid, and it will be exciting to see how the schools and organisations involved continue to act upon the Creative Schools Youth Voice principles identified at the start of the programme. For those keen to reflect on existing Youth Voice & Participation practice within their work and consider how to do more, try using the Sound Connections Youth Voice Equaliser self-assessment tool!